I am so happy to announce that registrations classes at Olds College Fibre Week are open. Equally excited to say that I am on the roster! There are four full-day spinning classes I’m on track for. 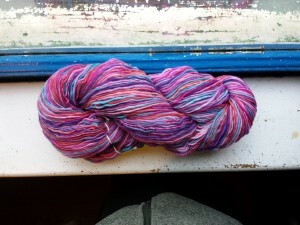 Do you have braids of hand painted top in your stash that you are afraid to spin? Or have you spun up a hand painted braid but then were disappointed with the yarn because the colours blended in a way you didn’t want and it ended up muddy and muted? Learn how to make a series of decisions that will help you get the yarn and effect you want from the colours in your painted braids. In this full-day workshop you will learn some basic and advanced techniques for working with hand painted top. Colour theory will be discussed and practically applied throughout the day. We will start with basic 2-ply techniques and move into the wondrous world of fractal spinning. After making several fractal samples, we will work on combination drafting and also learn how to make ombre yarn. Skills such as hand carding and Navajo plying will be learned along the way. At the end of this workshop you will be wild about colour and never again hesitant about working with hand painted top. Spindling 1.0 — We’re Making Yarn! In this workshop, you will learn basic spinning techniques for suspended spinning. These techniques will allow you to further explore making a variety of yarns with these noble tools. This class is for absolute beginning spinners, or for those who know how to spin with a wheel, but don’t know how to do it with a spindle. In this introduction to the spindle as a tool for making yarn, you will also earn about the properties of wool as a protein fibre for making yarn. You will learn how to draft fibre, put twist into it, ply and set the yarn– everything you need to get you started on your yarn making journey. Are you tired of making the same yarn – that no matter what you do, you are always spinning the same stuff? Do you want to be able to make yarn for a variety of purposes – so you direct the project instead of the yarn telling you what it will be? Well, you are not alone. This full-day workshop is all about busting through “default-yarn” – that yarn you make over and over again despite attempts to do it differently. In this workshop you will learn techniques that will expand your yarn repertoire. You will experiment with and learn about the effect of twist on your singles and your plied yarns. You will also learn about yarn structure by making samples of soft singles, 2-ply, chained (Navajo ply), and cabled yarns. 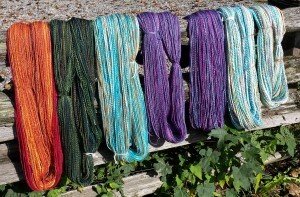 You will learn strategies for making the yarn you want. At the end of the day, YOU will be the boss of your yarn. Worsted and semi-worsted, woolen and semi-woolen – you may have heard these words used to describe yarn and spinning techniques and you also may have heard conflicting answers. What does it all mean? Explore and experiment with a variety of drafting techniques from worsted to woolen. Learn when and why, and most importantly, how to use these different drafting and spinning techniques, from short forward draw (worsted) through to the long draw (woolen). You will also get some tips on fibre preparation to help you get the yarn you want for your project. Expand your spinning repertoire so you have more choices in making the yarn you want, from strong, fine yarn for socks through to lofty, soft yarn for hats and sweaters. You’ll come away from this class knowing how to answer the worsted vs woolen question with confidence. Check it out here and sign up for a bucket load of fun and learning. This entry was posted in spinning workshop on March 24, 2016 by DianaTwiss. 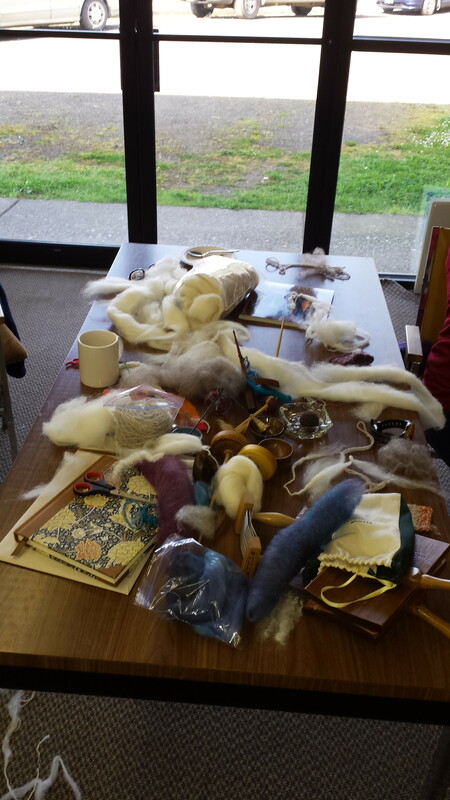 Last weekend I had the pleasure of travelling to Haida Gwaii to deliver two full-day spinning workshops. I had visited there for fibre arts teaching in 2010 and again in 2012. It is a magical place with creative, generous, big-spirited people. I can’t wait to go back again. 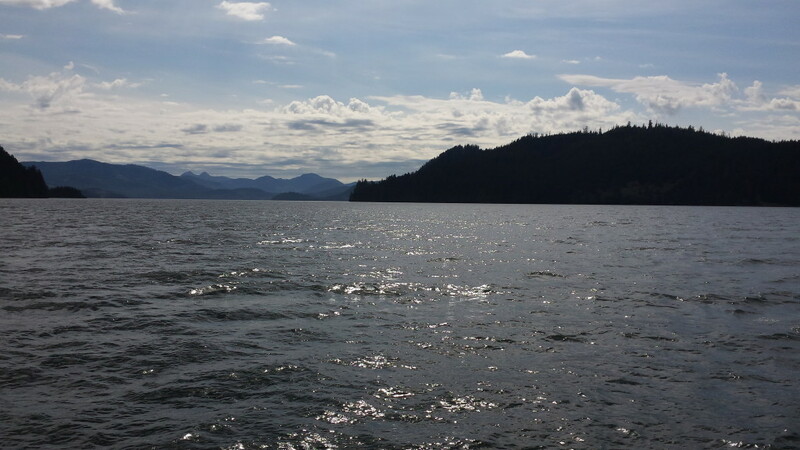 I landed in Sandspit and then traveled by bus/ferry to Queen Charlotte. Here’s the view from the ferry as we head south. 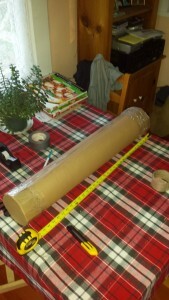 A week earlier I received my new Navajo spindle from Dave, my spindle guy. 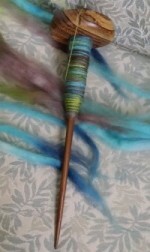 I spent the week learning how to use it so I could teach the people in my spinning class how to use this amazing tool. It is quite similar to the kind of spindles their ancestors used. Two days before departure it dawned on me that I had to somehow get this on the plane. 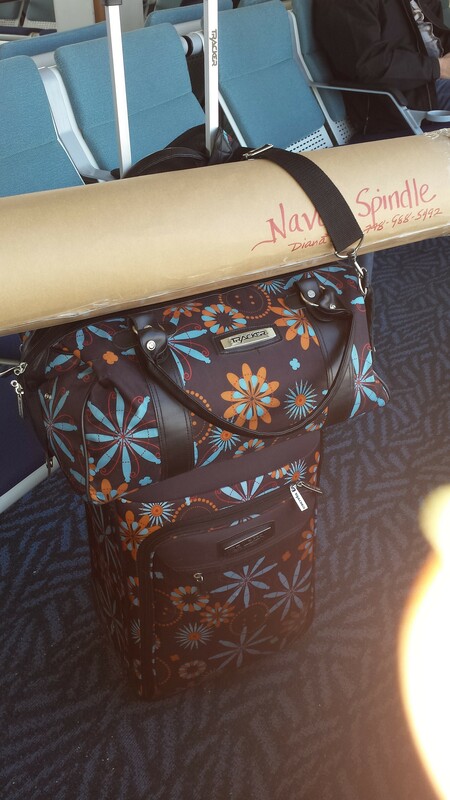 At 31″ long and 6″ in circumference, it wasn’t fitting into my large suitcase. After calling Air Canada and getting assurance that I could take it onto the plane, I set out to package it up. And here I am, past security waiting for the flight. I carried it to the plane and gave it to the “sky-check” guy who promised that it was going to sit at the very top of the pile, and not be crushed. 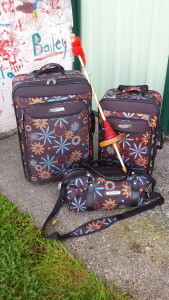 And the picture below is all the equipment and materials I needed for the full-day workshops. In these bags are several pound and varieties of fibre, several top-whorl spindles bottom-whorl spindles, supported spindles and even a Turkish one. Also inside are three pairs of hand carders, wool combs, knitting needles, resources books and handouts. And to top it all off, here is the view from our workshop. The weather was grand – full sun and medium heat. The participants made skeins of yarn, stretched their skills and had a lot of fun. I’d go back there in a heartbeat. 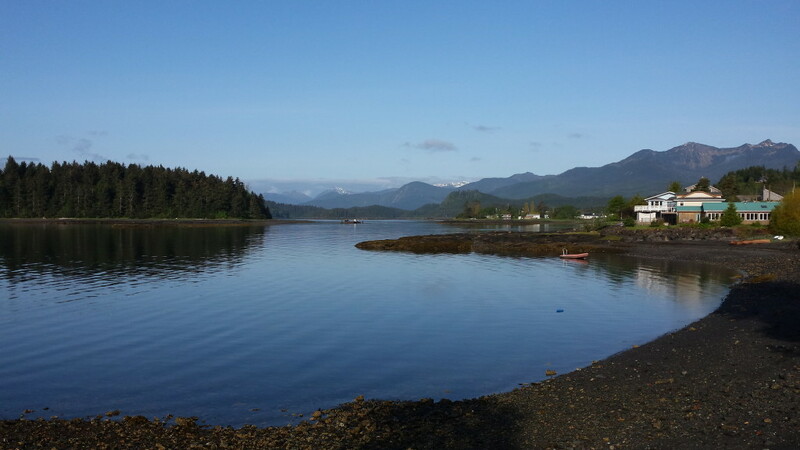 Thanks Haida Gwaii. This entry was posted in spindling, spinning workshop, Uncategorized on May 15, 2015 by DianaTwiss. 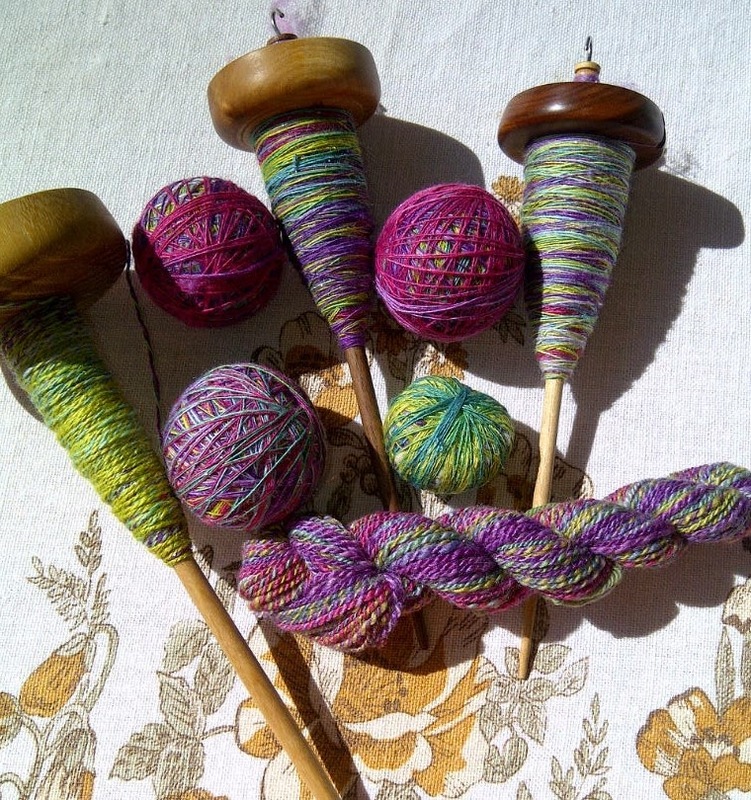 And for those of you have a little more confidence with your spindles, but want to take your spinning to another level, here’s another spindling class for you. I hope to see you there. For more information visit Fibreswest 2015. This class is for spinners who are able to make a continuous thread with a suspended spindle (also known as a drop spindle) and want to learn more. In this 4- hour class, participants will learn some techniques to make their spindling experiences much more satisfying by learning all the basics such as making a leader, drafting and winding on. We will also explore drafting techniques such as spinning from the fold, worsted and woollen and strategies for spinning difficult or challenging fibre. An assortment of ways to ply yarns (along with Navajo Plying) with a spindle and the importance of setting your yarn and how to do it will round out our day. Material fee: $15 payable to instructor plus an additional $45 if you wish to purchase a Houndesign spindle for your class. Equipment needed: suspended spindle, top whorl preferred. Bring a variety if you have them. If you are planning to purchase from me please indicate on your registration form. 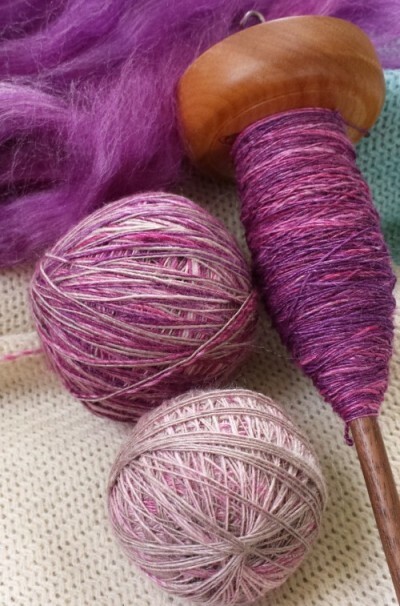 This entry was posted in Fibreswest 2015, spindling, spinning workshop on January 18, 2015 by DianaTwiss. Registration for Fibreswest 2015 is now open. Check out the classes. In the following three posts, I will be highlighting some of the classes that I will be teaching there this year. Hope to see you there. In this 4-hour workshop, participants will be introduced to the basic spinning techniques for suspended spinning. These techniques will enable participants to further explore making a variety of yarns with these noble tools. This class is for absolute beginning spinners, or for those who know how to spin with a wheel, but not a spindle. In this introduction to the spindles as a tool for making yarn, participants will learn about the properties of wool as a protein fibre for yarn. They will also learn drafting techniques, and how to spin, ply and set yarn. Topics covered include: varieties of spindles – how to choose one and how they work, choosing fibre – the properties of wool and working with wool, spinning on a spindle – park and draft technique, drafting, worsted and from the fold, winding on, making a cop and dealing with a full spindle. Plying your singles and finishing your yarn will also be covered. Equipment needed: suspended spindle, top whorl preferred. Bring a variety if you have them. If don’t have one want or wish to add to your collections, spindles will be sold at the workshop for $45 each. If you are planning to purchase from me, please indicate on your registration form. Empty shoebox – to be sued as a Lazy Kate and to hold our materials. Last Sunday we had the fourth and final (for now) spinning lesson at my place. We had a lot that we still wanted to get done so I was quite a task master. First thing we did was a lot of spinning. I wanted to make sure each one not only had the basics of drafting and putting twist into the fibre, but that they were able to troubleshoot any problems at would arise as they spun. Happy to say that all four spinners are making a continuous thread that gets more and more consistent each week. And for the most part, they can figure out how to fix a problem like over or under twisting, and are in much more control of their wheels. In the beginning, we often feel that the wheel is controlling us and it takes some time before your get the upper-hand. Once you do, you are well on your way to being an independent spinner. It’s fun and funky yarn. Below is a small sampling of the fibres we were working with — mostly wool in a variety of colours, but there was also some kid mohair thrown in, you can see that in the top right corner. Added to the mix was all sorts of other things, bits of silk noil, cut up silk hankies, pieces of commercial yarn that has texture. All this gets made into “fibre sandwiches”. Each sandwich has a layer of fibre, some yarn bits, another layer of different fibre, more texture bits and finish off with a final layer of fibre.This sandwich gets fed into the drum carder. Usually 4 or 5 sandwiches do the trick and you have a decent sized crazy batt. Here’s what our table looked like when we were in full production. After making crazy batts for about an hour, I demonstrated how to use the picker. It’s a crazy looking and highly dangerous piece of equipment that you use to tease the fibres to get them ready for drum carding. If you are into a high level of production, it’s a good idea to have one. But one way or another, it’s a good idea to learn the right way how to use that piece of equipment. You can ruin fibres and ruin your arm if you don’t do it right. Major rule: never, ever put your hands near the teeth. However tempting it may be to just pull a bit of fibre out of the way. Always use another tool, never your own hand. So the class and I are taking a break for a few weeks. Lambing is coming on and other family obligations have us busy for next few Sundays. But we are going to start up again with more fibre preparation, more spinning techniques and more fibres. 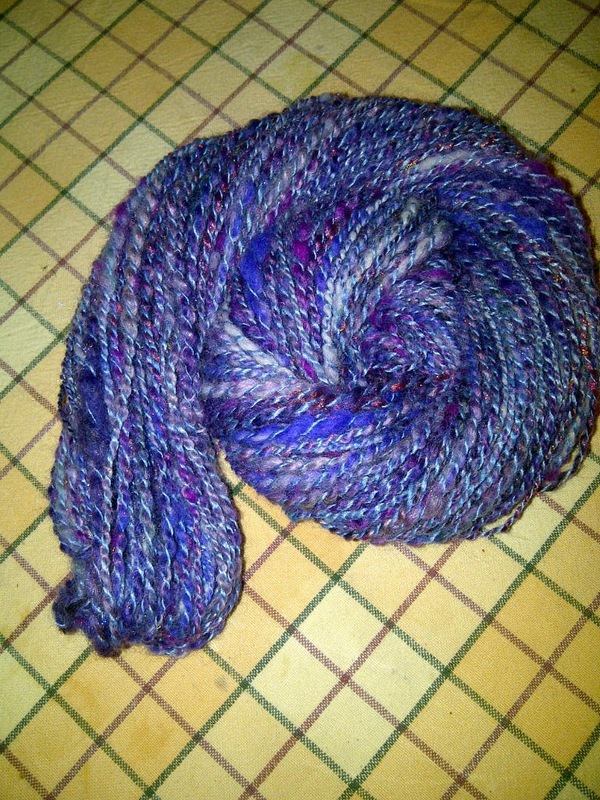 This entry was posted in drum carding, handspun yarn, picker, spinning workshop on February 19, 2013 by DianaTwiss. Today we had our third spinning lesson here in my farmhouse at the end of the road. We went over time as we had so much that we wanted to get done, and no one seemed to mind. First, we did a lot of spinning. 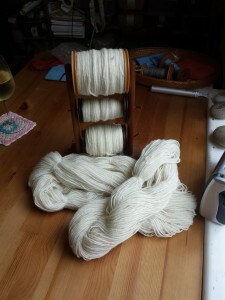 I wanted the gals to have two good sized bobbins of singles — one in white, one coloured — so they could learn how to ply. The twist was really active in the singles, as they had just been spun, so the plying was a bit of an adventure in patience and persistence. 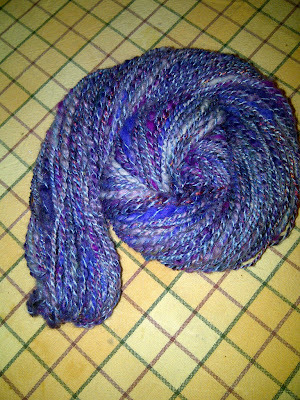 Everyone made a lovely good sized skein. Should have taken photos of them, but was so busy with everyone, I totally forgot about documenting it. 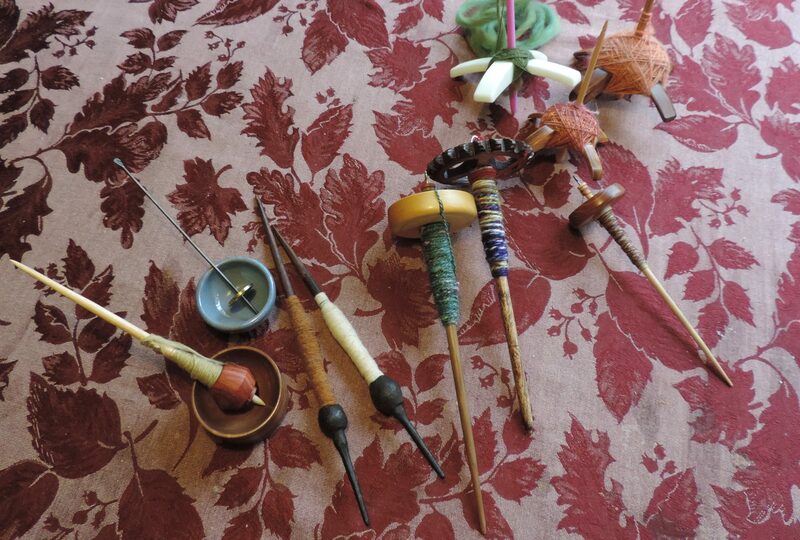 After we did the spinning and plying, we moved over the next room where I had drum carders and a Louet picker set-up. I showed them how to use the Louet picket to tease the fibres apart and then load them onto the drum carder. Everyone made some batts and a had generally good time experimenting with the different pieces of equipment. Here’s the Louet picker. It’s the oddest looking piece of equipment but it does a nice job opening up the locks for the drum carder. I haven’t had a lot of satisfaction using the rolling pin type piece, but I just use my Ashford carders instead. I toss some fibre onto the carding cloth area, and then with my hand carder, just card one way, and then the other. When I go the other direction, the fibre all comes off and then it goes over to the drum carder. Magic. What used to take hours of teasing, can now be done in minutes. Really. And here’s a photo of the front room, full of spinning wheels, six of them even though there were five of us in total. It’s a small space but we make it work. Thanks Heather, Katie, Diane and Tannis for a terrific day. You are all turning into great spinners. This entry was posted in spinning workshop on February 4, 2013 by DianaTwiss.